Starting this month with a healthy breakfast recipe - Quinoa Dosa. Quinoa is pronounced as 'KEEN-wah' and it is a nutritious gluten-free seeds, originally from the Andean region of South America. Its a good source of protein, dietary fibers, vitamin B and iron. Its good for people suffering from diabetic and cholesterol too. My in-laws brought some packets of Quinoa from their last visit to US and gave me a packet. My hubby started making faces as he hates Quinoa. I was wondering what to do with it. Heard we can substitute quinoa for rice but then nobody would even try to taste it once they know its a Quinoa item. 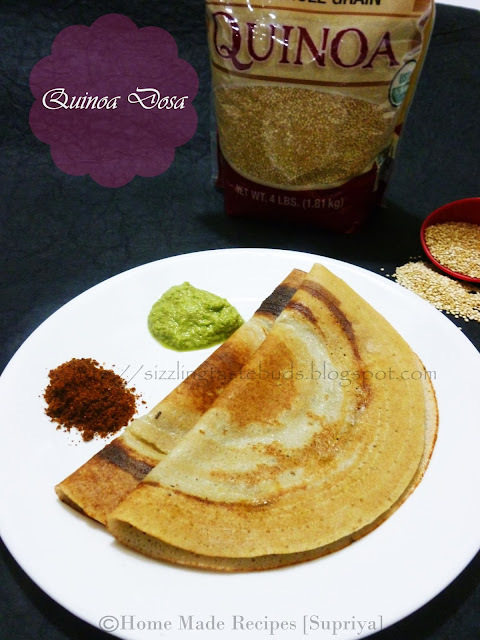 So tried disguising Quinoa and made Quinao Dosa. Only after they had the breakfast I revealed the truth and had a good laugh. 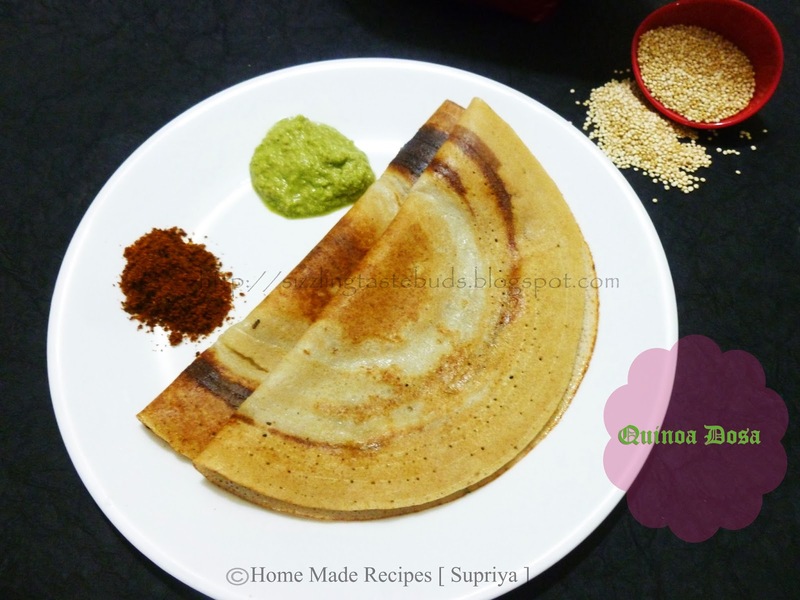 If you have a fussy eaters in your home, then try this in a Dosa form and they will never know. 1. Wash and soak all the ingredients mentioned except oil and salt for atleast 4 hours. 2. Grind the soaked ingredients to make a smooth dosa batter. 3. Mix all together and allow it to ferment overnight. 4. Add Salt to taste the next morning and mix it thoroughly. 5. Heat Dosa pan and make thin dosa's out of this, drizzling oil as needed. Cook on both sides. 6. Serve hot with any chutney powder or spicy coconut chutney. very very healthy dosa :) they look so perfect ! !